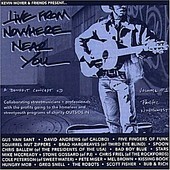 Live From Nowhere Near You, Volume 1 is a 75-minute concept CD collaborating street musicians with well-known musicians. Besides melding the two worlds, the album also features a greater purpose, with all proceeds going to the Outside In foundation, a non-profit in Portland, Oregon (where project producer Kevin Moyer lives) that helps low income adults and homeless youth land back on their feet. With everyone from Gus Van Zant, Spoon, Squirrel Nut Zippers, Chris Ballew (of the Presidents of the United States of America), Stars, Pearl Jam's Mike McCready and Stone Gossard, and many others donating their time and talent to help out. Live From Nowhere Near You is both an experimentation that wildly succeeds and shines. As well as a positive, hopeful record that plans to show that the power of music can, and will, help those less fortunate find a voice and pick themselves back up, despite any obstacles. "Hatin'" finds local hip-hop sensations Five Fingers of Funk, along with street kid Stylz on turntables, delivering a soulful, uplifting number that is both melody- and groove-laden. While "Song for the Streetkids" (including an ending that was drummed on a beat up shoe) is freight train traveling vagabond punks playing gypsy Thai guitar, fiddle, and their mandolin. Then there is straight-ahead rocker "Powerless", done by a Seattle supergroup consisting of Mike McCready, Stone Gossard, Cole Peterson (Sweetwater), and Chris Frield (The Rockfords). The highlight of the album, and the true meaning behind Live From Nowhere Near You, however, is "Rendezvous You", a hip-hop soaked, jam-laden, funky merger of various sounds collected from street audio, which starts off the album. A concept album in the most unlikely, but most deserving sense of the word, Live From Nowhere Near You, Volume 1 is 75 minutes of the meaning of music, a collage of musical expression as it sways from hip-hop to rock, folk to electronics, and everything in between. Here is music in its rawest, purest form. I'll give it an A-.